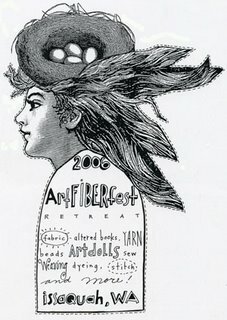 Vendor Night at Artfiberfest on Friday Night June 23. Address is: Trinity Lutheran College - 4221 228th Ave. SE. Issaquah, WA 98029. Here is the list of vendors: Fabric Frog Designs, Orange Bus Studios, Lisa Engelbrecht, Sassy Art Goddess, Paper Squirrel, Darlene Veltman, Mother Rubber, Atlantian Dreams, Shades of Akasha, The Red Door Studio, Marilyn's Nouvelle Collection, Lisa Bias, Denise Marie Doll Art, Suz Simanaitis, Pam Garrison, Kate Lyon, Traci Bautista, Kari Bjorklund, DJ Pettitt, Creative Art Diner, Lampe's Lumps, Barbe St. John, Elise Peeples, Mary Stanley, Zettiology. There will be SO MUCH MORE than fiber related art and supplies...it's a rare opportunity to get to purchase from these vendors. No admisson charged. This is a really fun event with tons of super cool people and amazing stuff to buy. I will have all sorts of goodies. if you would like to pre order anything, just drop me a note. See you soon! June 12, 2006 by carol strand.